Colorado Springs, Colorado. 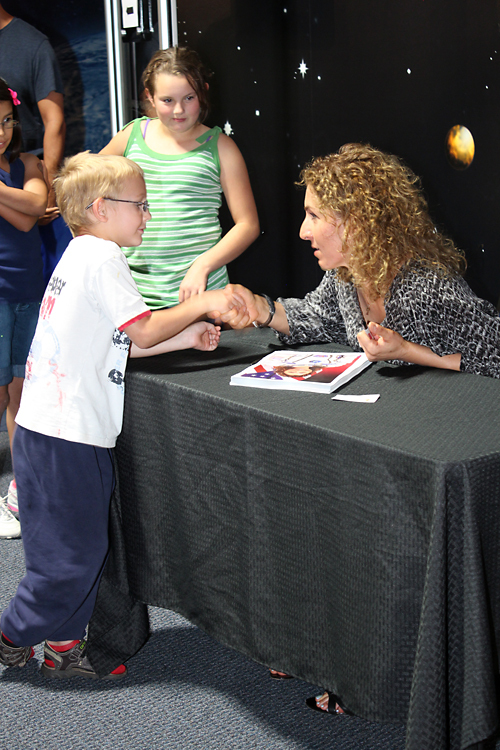 August 1, 2014 – Anousheh Ansari visited the Space Foundation Discovery Center in Colorado Springs today to unveil her official portrait and to sign autographs for the public. While she was there, she encouraged kids to dream big. Ansari knows what it’s like to dream big. As a young girl in Iran, she would go outside at night and stare at the stars. Her dream was to go into space. Ansari immigrated to the United States as a teenager and didn’t speak any English. With hard work and determination, she earned a bachelor’s degree in electronics and computer engineering from George Mason University, followed by a master’s degree in electrical engineering from George Washington University. Ansari then began her life as a highly successful serial entrepreneur. She was co-founder, CEO and chairman of Telecom Technologies, Inc. In 2004, Ansari’s family provided the title sponsorship for the Ansari X Prize, a $10 million cash award for the first non-governmental organization to launch a reusable crewed spacecraft into space twice within two weeks. That feat was accomplished by legendary aerospace designer Burt Rutan, and helped launch a new era in private spaceflight. In 2006, Ansari became a beneficiary of the new spaceflight era and finally made her dream come true. 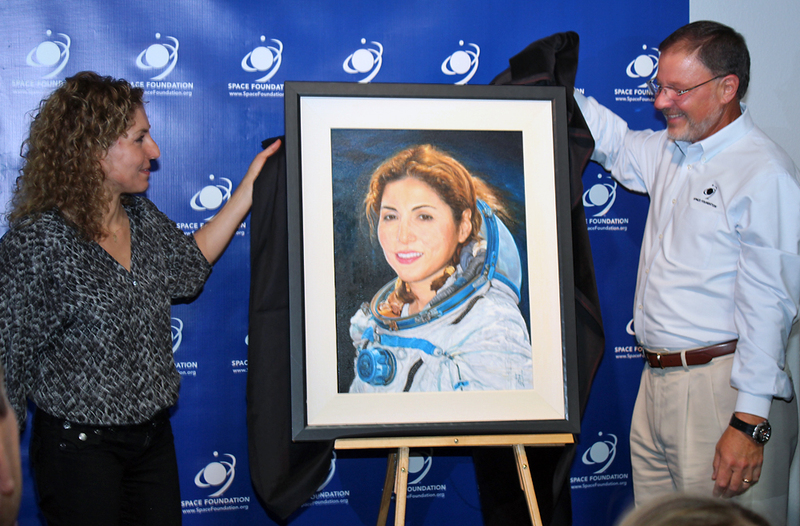 It’s unknown how much she paid for the opportunity to travel into space aboard a Russian Soyuz capsule and to spend eight days living on the International Space Station, but she captured headlines as the first female private space explorer and the first astronaut of Iranian descent. During her talk at the Discovery Center today, she spoke about the challenges of training for space and how much she loved weightlessness, despite some initial motion sickness. She also spoke about the importance of the commercial space industry and the expanding opportunities for people who dream of going into space. Since her return to Earth, Ansari has acted as a Space Ambassador, sharing her experience and inspiring youth, especially girls, to pursue their dreams. As she signed autographs, Ansari spoke with each of the kids who attended and encouraged them to dream big. Ansari is currently the co-founder and chairman of Prodea Systems, which has partnerships to create a fleet of suborbital spacecraft for commercial use. She has received multiple honors and promotes strategic philanthropy and social entrepreneurship. Her memoir, “My Dream of Stars,” was co-written with Homer Hickam and published in 2010. You can see Ansari’s portrait on display at the Discovery Center, 4425 Arrowswest Drive, Colorado Springs. The Discovery Center is open Tuesday through Saturday, 10:00 a.m. – 5:00 p.m., with occasional evening events. The Discover Center is closed on Sunday and Monday and on holidays.